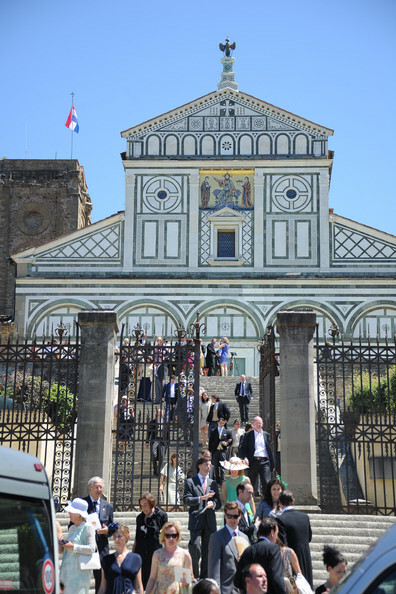 At the Basilica San Miniato al Monte in Florence Italy. 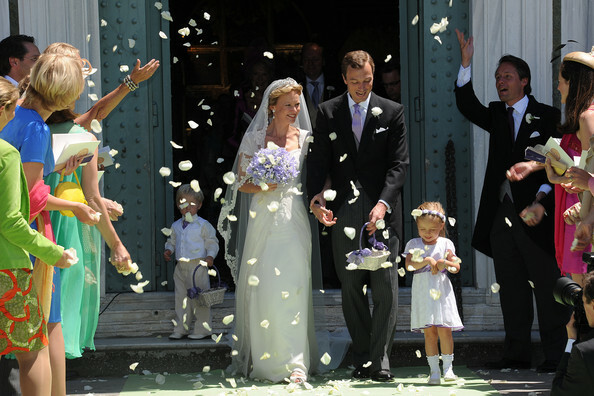 First a little background on the bride: Princess Carolina is fourth and youngest child of Princess Irene of the Netherlands (sister to Queen Beatrix of the Netherlands) and Carlos Hugo Duke of Parma. Carolina is a member of the Dutch Royal Family. 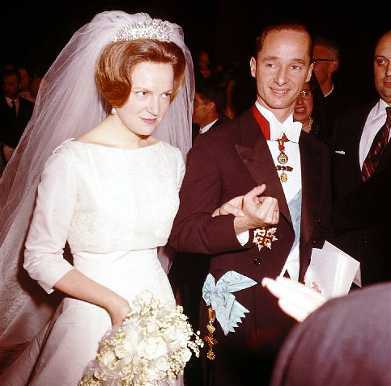 When her mother, Irene of the Netherlands, married Paris-born Carlos Hugo de Bourbon in Rome Italy in 1964, no member of the Dutch Royal Family attended the wedding. Why? Well, here you go: the marriage caused a constitutional crisis in the Netherlands. Irene lost her rights of succession to the Dutch throne because the government refused to enact a law permitting the marriage (Ay Dios Mio!). 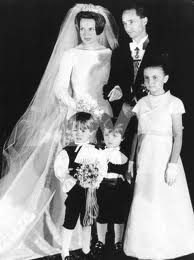 In 1962--two years before she got married to el Escandaloso Carlos, Princess Irene of the Netherlands just happened to be a Bridesmaid at Prince Juan Carlos and Princess Sofía's wedding in Athens Greece. 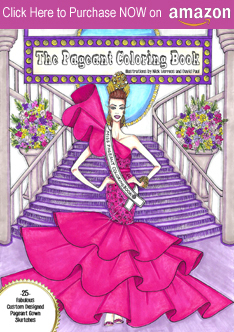 Check out the rest of the illustrious Bridesmaids (it reads like a "Who's Who of A-List Blue-Blood Royalty! 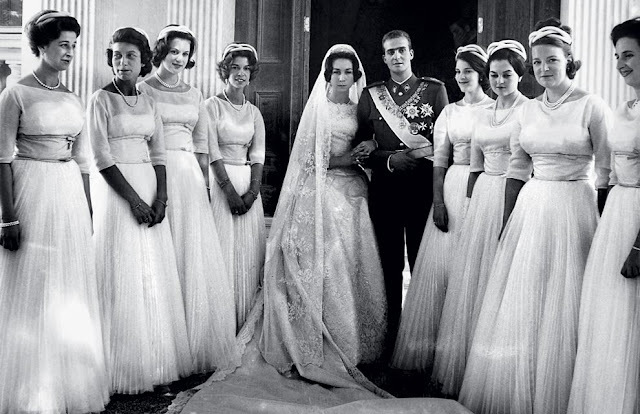 ): From left to right in the photo: Princess Alexandra of Kent, Princess Tatiana Radziwill, Princess Benedikte of Denmark, Princess Irene of Greece, Princess Anne-Marie of Denmark, Princess Anne of France, Princess Irene of the Netherlands (second from the right) and the Infanta Pilar of Spain. Anyhow, Carlos and Irene of the Netherlands divorced in 1981 and Princess Carolina's father--Carlos Hugo de Bourbon--passed away almost two years ago. That was in her mother's Wedding Gown from 1964 (as seen above) and placed it in Carolina's gown and veil. According to his pr people, it took months to restore and make the lace embroidery "come to life" for 2012 standards. 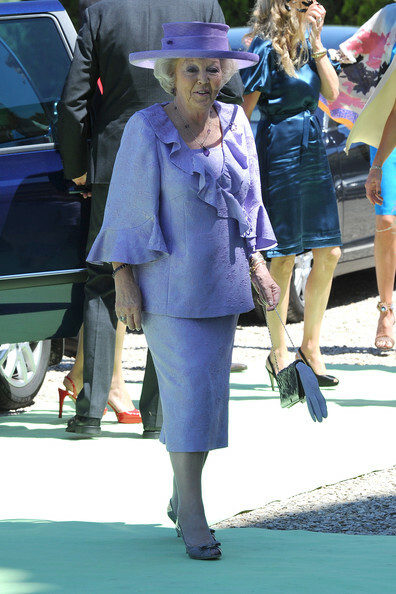 Queen Beatrix of the Netherlands: One of the Richest Women on Earth, Queen Beatrix of the Netherlands--the Bride's aunt--wore a mauve-colored silk jacquard suit with bell-styled sleeves with ruffles; the jacket also featured cascading ruffles down the front.Matching hat, gloves, shoes and hosiery of course, as only a Queen would do. Feathered: the always stylish Princess Maxima of the Netherlands (far left holding on to her Mother-in-Law Queen Beatrix and her husband Willem-Alexander Prince of Orange, on the far right)--wore a taupe ensemble with a blouson top, feathered shirt and bell-shaped sleeves. 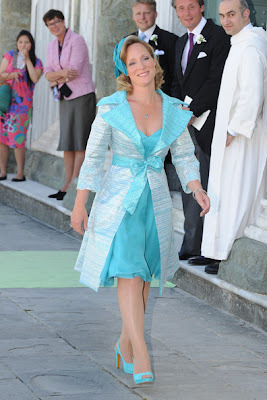 The Argentinian-born Crown Princess to the Dutch throne finished it off with a fabulous hat. Fab Shoes Ladies--and Gentleman: Princess Marilene and Prince Maurits of the Netherlands (10th in line for the Dutch Throne) (left pic) and Prince Bernhard (11th in line for the Dutch Throne) and Princess Annette of the Netherlands (right photo). I LOVE the bejeweled ankle-strapped heels of Princess Marilene on the top left photo. And take a look at Prince Bernhard's silver shoes!! Those Dutch boys can really give it you...when it comes to "Yeah, I'm royalty but I'm still a Hipster Fashion Boy!" Polka Dots, Prints and...OH HUNEY: Two guests on the left pic showing how it's done when attending a semi-royal wedding Florence Italy. I LOVE this woman in her orange-and-white bold polka dot printed chiffon dress and silver sandals. She's my new Best Friend! And speaking of friend, whoever is next to her is also working the printed dress look to no end. The colors are absolutely fantastic! On the right photo we have Margarita de Bourbon (the Bride's older sister), who decided to go "Tacky Wedding Party" in her baby blue ensemble featuring a too-wide notch-collared/lapel coat. Poor thing, she looks like she didn't get the COUTURE memo...those over-sized coat lapels are something straight out of a Fashion Student's sophomore-year project. 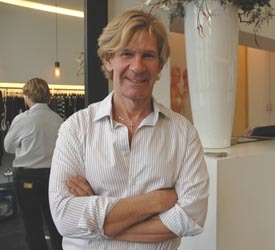 4 Responses to "ROYAL COUTURE.....Wedding of Princess Carolina de Bourbon-Parma"
Hello Nick, like your blog a lot. The lady in orange polkadot is HRH the princess Christina of the Netherlands, youngest sister to HM Queen Beatrix, she is almost blind. Next to her standing is Juliana Guillermo her daugther and youngest grandchild of the late Queen Juliana. If you go to the site of PPE you can find many pictures of this wedding. Which includes pics from the inside of the magnificant Basilica, HRH the princess Margriet, the mother of the B-groom and many others. Nick! Love your blog!! Very interesting about the runway sample on lady gaga.. now i’ll know! I would love if you could check out my blog, I have a unique sense of style! The Van Vollenhoven boys are a disgrace! They clearly got the dress code wrong, it was morning suit, not lounge suits. And honestly, silver shoes? Or brown shoes under a grey suit? Urm, no thank you! I don't think anyone is a disgrace! 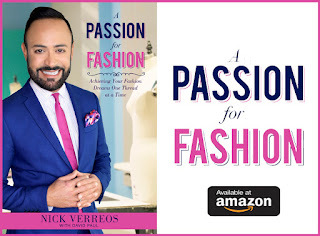 I just think that everyone has the right to a fair decision on their own fashion choice of colors and styles. At least their wore brilliant colors to add to the new happy couples wedding! I'm a 18th generation member of the royal family of the Netherlands.